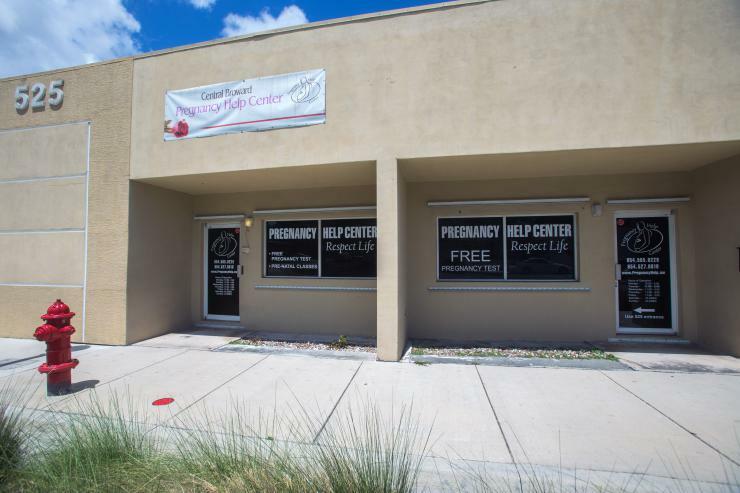 Exterior of Central Broward Pregnancy Help Center, which is located at 525 N.E. 13 St., #527, Fort Lauderdale, 33304. 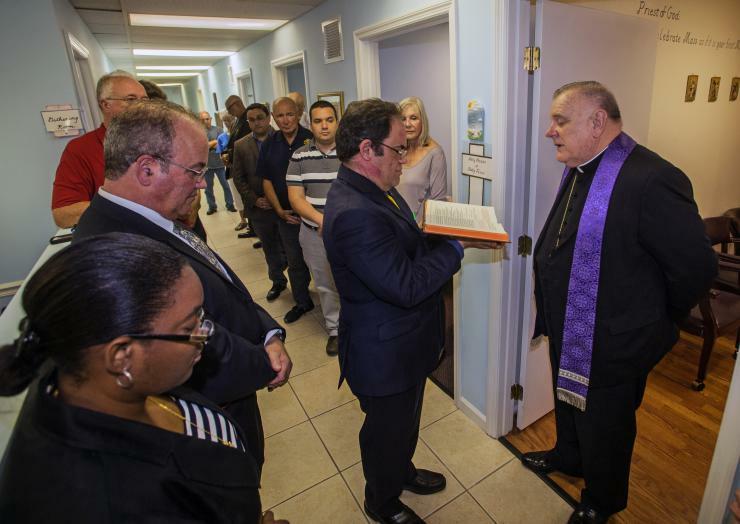 Archbishop Thomas Wenski blessed the new ultra sound machine at the Central Broward Pregnancy Help Center April 12, 2019. Archbishop Thomas Wenski reads a passage from the Bible as radiologist Dr. Modesto Sanchez-Torres holds the book. Archbishop Thomas Wenski blesses the new ultra sound machine at the Central Broward Pregnancy Help Center April 12, 2019. Kyle Riebel, of the Knights of Columbus Council 4955, presents a check for $5,000 in support of the ongoing costs of the ultrasound machine to Judnis Francois, second from left, the Central Broward Pregnancy Help Center coordinator. 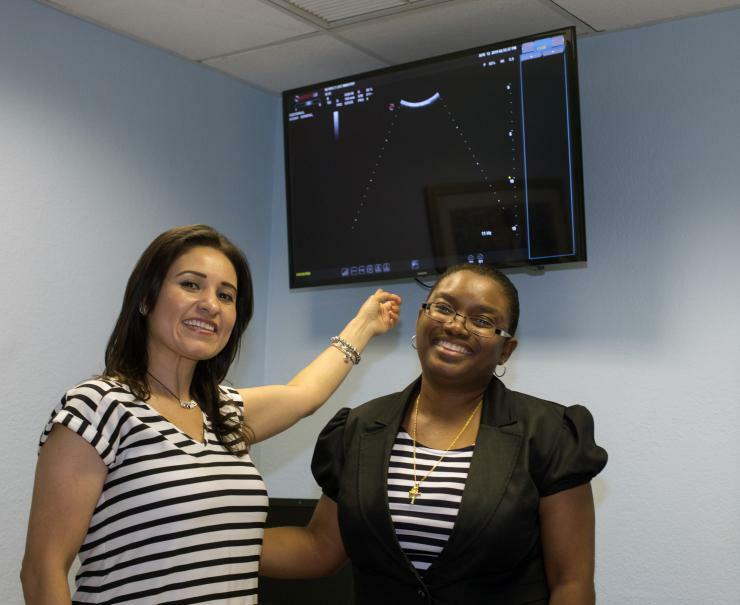 Ultrasound technician Lorena Villaneda-Romero, left, points to a big-screen television that displays a picture of the unborn baby that the mother can see, as she stands next to Judnis Francois, coordinator of the Central Broward Pregnancy Help Center. FORT LAUDERDALE | Four of the five Archdiocese of Miami Pregnancy Help Centers had ultra sound machines. Now the final imaging device is in place at the Central Broward office, ready to show expectant mothers the baby they are carrying. Ultrasound technician Lorena Villaneda-Romero, left, points to a big-screen television that displays a picture of the unborn baby that the mother can see, as she stands next to Judnis Francois, coordinator of the Central Broward Pregnancy Help Center. The Knights of Columbus Council 3080 raised $15,000, half of the $30,000 cost of the Esaote MyLab Six ultrasound machine. The Knights’ Supreme Council agreed to pay the rest through a 10-year ultrasound machine initiative which gives millions of babies a chance at life. 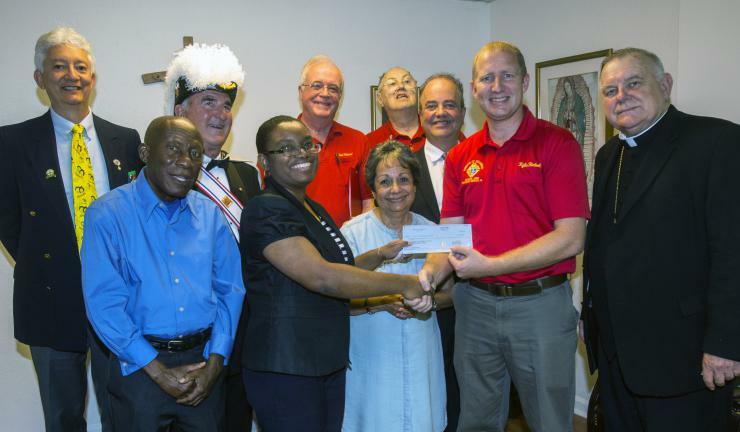 In addition, Knights of Columbus Council 4955 donated $5,000 to the Central Broward office in support of the ongoing costs of the ultrasound program and an expansion of the pregnancy help center. The added space came from an adjacent storefront that formerly housed a Protestant church. The center was renovated and has increased to 9,000 square feet. Newly-appointed Central Broward office coordinator, Judnie Francois, said it takes about $150,000 annually to run the center. Archbishop Thomas Wenski blessed the expanded facilities and the new ultrasound machine April 12, calling it technology for the good of mankind. Catholics should be witnesses of hope, he said. They should offer hope and joy. The Knights of Columbus have placed about 1,000 ultrasound machines in pro-life centers throughout the United States. Florida leads in the number of machines — 88 — purchased with the Knights’ help, said Eduardo Suazo, Culture of Life director for the Florida Knights of Columbus. Dr. Modesto Sanchez-Torres, a radiologist and Culture of Life coordinator, will read the ultrasounds by way of a secure internet connection. “I will read the images through DICOM, Digital Imaging and Communication in Medicine, a standard for the communication and management of medical imaging information,” he said. 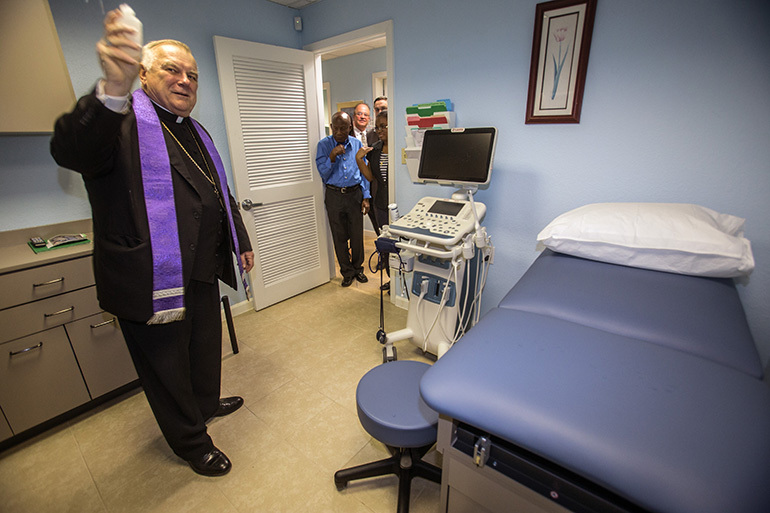 Archbishop Thomas Wenski blesses the new ultra sound machine at the Central Broward Pregnancy Help Center April 12, 2019.